The whole experience started weeks before the march itself began. Leading up to the march, folks were rallying around the logistics of getting there. I started looking into travel plans weeks ahead of time, but the organized buses sold out quick. Being something of a procrastinator, by the time I went to book buses from Boston, the options were no longer convenient or cheap. So I looked to event’s webpage and was delighted to find a forum where folks where offering and requesting rides. Participating in that forum made me certain I wanted to be there – strangers were going out of their way trying to help each other get there by making connections. That was my first boost of inspiration around the event, I was really feeling the love (and hopefully helping to spread it). Thanks to that forum, I ended up traveling down (via hybrid) with three great people I would have never otherwise met: Ken, an engineer; Mars, a recent college grad; and Dave, a neuroscience post-doc. A nice crew that thankfully wasn’t super chatty. I admittedly came out the gates a bit hot during the 5am hour with introductions and such (sorry, guys) but mellowed out once we hit the highway. I wore jeans, sneakers and a white t-shirt. I didn’t carry I sign, I wore a backpack. You wouldn’t necessarily have known that I was headed to the march, save for my green circle pin (The Climate Reality Project indicia of “Climate Leaders”). Of course there were super greenies who stood out, but there were a lot more just real people than I expected. People whose values weren’t obvious by looking at them. There were midwestern moms, liberal students, “raging grannies” (their term, not mine), cute dads (my term) with kids on their shoulders, musicians, artists, and beyond. Just a big bunch of all sorts of people. 400,000 people from all walks of life that care about this issue in a big way. Such a well of inspiration. The actual march itself was like going on a long, slow walk with almost half a million of your new best friends. The spirit of community struck me more than I had anticipated. Not so much cheerleader spirit as much as “we’re all here for the same reason” spirit. It had a bit of a music festival vibe. Everyone had their own angle on the cause and the solutions, but there was a general sense of respect and togetherness that seemed unmatched. Except maybe at Woodstock, from what I’ve heard. Or Burning Man. I dunno, I haven’t been to either. Anyway… The uptown C train on the way to the march was more hectic than any train I’d ever seen in the seven years I’d previously lived in New York, so I knew to expect quite a crowd. But more than an hour before the march took off, I didn’t expect so many people to already be in position. The whole thing was expertly arranged. 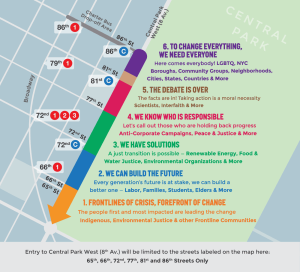 The organizers put together a map of the lineup, encouraging like-minded groups to walk together.Though I started near the middle – in the “solutions” group with my people (renewable energy) – I struggled to walk as slow as the pace of the march, so I crept up through the crowd ahead. And I’m glad I did; weaving in and out of the other sections enabled me to experience all sorts of different groups and hear their concerns. There were chants, dances, performers (an absurdly talented hula-hooper and a woman dressed as Charlie Chaplin), musicians, floats and biker gangs. Bicycles, not hogs. I ended up amidst the interfaith group for a while. And walked through a spontaneous human tunnel, how fun! I tried to find specific other groups, like the winter sports enthusiasts with Protect Our Winters and Kaylin Richardson (pro skier and Climate Reality ambassador) – but the sea of people seemed endless and I just couldn’t find them. A disappointment particularly because I later learned from Kaylin’s instagram feed that I’d missed out on the running man. There was a particularly strong contingent of vegans, which caught me by surprise but makes great sense. They lined up in the “solutions” section, touting veganism as a way to reducing greenhouse gas emissions. And they’re right, cattle release methane that is significantly worse for the atmosphere than carbon dioxide. But no solution alone can solve the climate crisis, which is a great parallel for the collective of people and groups that attended and how we all need to come together to make change. Every angle matters and all the solutions make a difference. The climate issue can’t be addressed in a vacuum. It’s a whole-system issue and needs a whole-system response. One of the most touching moments was when we walked along the southern edge of Central Park on 59th Street. There was this group of young people standing on rocks in the park, cheering for us. We cheered back. I can’t speak for the marchers around me but I can say that it gave me a boost of energy to keep going. So thanks, guys. I was also impressed by how many folks with physical ailments were marching. People for whom walking caused them physical pain – that’s how much they care. There were pedicabs offering free rides to marchers. I saw NYPD giving thumbs up to the crowd and recording video of the march, that was pretty unexpected and nice to see. And I swear I marched next to Chloe Sevigny for a bit. For every one of the 400,000 people that made it to New York on Sunday, how many more were there in spirit and following along on social media at home? I was almost one myself, but I’m glad I set the alarm for 4:30am on Sunday to be there and see the faces of the people who care. I went expecting to get a boost of energy around the cause, and I did. But where I really found the most inspiration was from the people, the interactions and the collective sense of unity around an issue that, as the World Wildlife Fund folks made clear, is very much a human issue. My father always told me that my generation didn’t protest enough. While my generation was certainly not the only present, I’m happy to make him proud and stand up for what I believe. Alongside 400,000 of my new best friends, whom I’ll never see again! 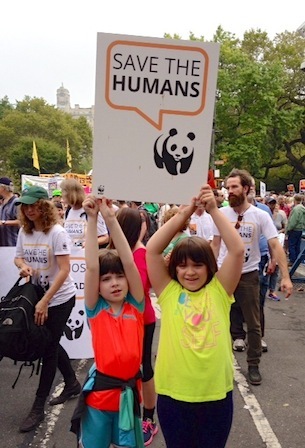 Thanks to all the organizations that coordinated the People’s Climate March and to New York City’s finest for making it possible. No doubt it’s brought awareness to the issue, let’s hope it influences our world leaders as they convene this week at the UN. 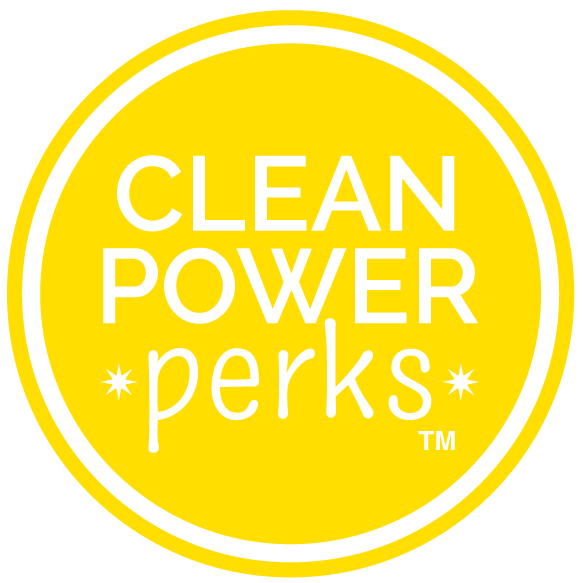 Tess O’Brien is the Founder and CEO of CleanPowerPerks. She loves people and the planet.